You might not expect much from a Dylan tribute album limited to the artists of one small label, but if so, you’re in for a surprise: This CD turns out to be every bit as inspired as anything on the all-star Madison Square Garden tribute that marked Dylan’s 30th year in the music business. One reason is that the artists on the Red House label (which happens to be based in the state Dylan hails from) prove extremely well-suited to the task and well-matched to the material. Another is that that material is just so darn wonderful. There’s no way a single disc could do justice to the mind-bogglingly large Dylan catalog; this could have been a 10- or 15-CD set and the quality wouldn’t have flagged one bit. In fact, this collection doesn’t even touch on such career highlights as Blood on the Tracks; it focuses mostly on the 1960s when, as the liner notes point out, most of the artists here were in their formative years as performers and Dylan was their major musical influence. Of course, if you have to pick one Dylan period, the 60s era isn’t exactly a bad choice. The results here are stunning. 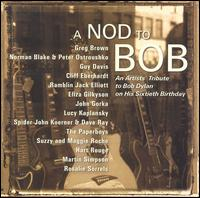 While there’s not a weak track on the disk, standouts include Suzy and Maggie Roche’s version of The Basement Tapes‘ “The Clothesline Saga,” which perfectly captures Dylan’s humor; Cliff Eberhardt’s “I Want You,” which transforms the upbeat original into a somber, haunting ballad; Guy Davis’ accordion-spiced “A Sweetheart Like You,” which features drumming by the Band’s Levon Helm; and Martin Simpson’s effusive “Boots of Spanish Leather.” Only one small gripe: Why include a cover—albeit a good one—of “Delia,” an old blues that Dylan himself merely covered, when there are so many superb Dylan originals to choose from? But that’s a small gripe indeed. If you’re a Dylan lover, this album is a must—and if you’re not, one listen will probably go a long way toward changing that.